The cocaine wars of the late 70’s and early 80’s cemented south Florida’s position in American crime lore. However it's a position characterized by a much less than sensational criminal history. This one does not include murderous matriarchs like Griselda Blanco, or flamboyant fliers like Mickey Munday. It revolved around one of the more “benign” of all illegal drugs: marijuana. 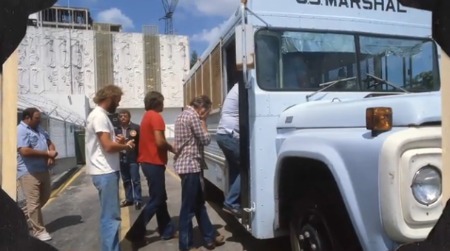 Square Grouper: The Godfathers of Ganja takes us inside three groups of pot smugglers that defined the trade as it came to be known in South Florida. All three stories revel in the slightly bizarre, sometimes tragic, and ultimately working class world of weed smuggling. Billy Corben immortalized the Miami “cocaine wars” with the infinitely watchable Cocaine Cowboys films. They were documentaries that moved with the pacing and color of an action picture or a sensationalized crime epic. They did so without foregoing realism and insight. 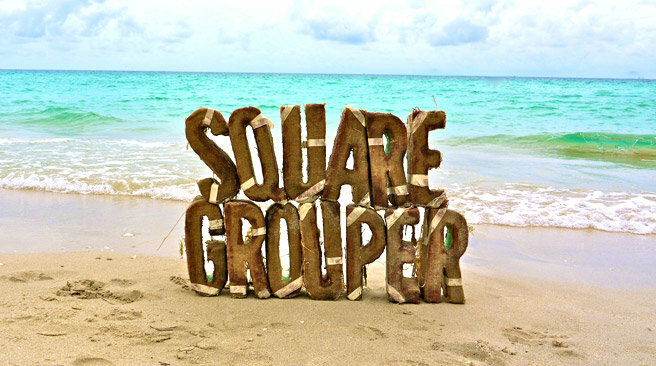 Square Grouper attempts to do the same for marijuana smuggling. The results are solid, but decidedly more mixed and less compelling than Corben’s first two forays into south Florida crime history. The first chapter chronicles the rise and fall of the Ethiopian Zion Coptic Church. The church was founded in Jamaica as an expansion of the Rastafari movement. It later branched out to Miami and became incorporated with the help of Thomas Reilly aka “Brother Louv.” The church saw the use of marijuana as a holy sacrament, and suggested that Christ was persecuted because he was a “Ganja Man.” The organization was staunchly conservative on its views regarding sexuality, but comically liberal in regards to the smoking of herbs. Vintage 60 Minutes footage shows children toking from huge spliffs. The most amusing part of this segment was seeing American white guys engaging in slight, faux Jamaican Patios. The Church was later revealed to be a front for a major marijuana growing/smuggling operation that grossed hundreds of millions. 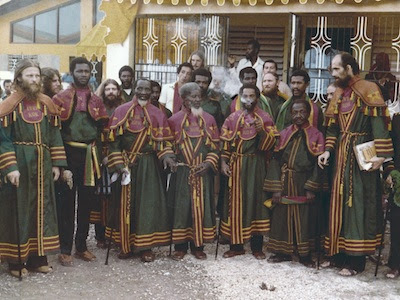 The congregation of the Ethiopian Zion Coptic Church, with Thomas Reilly aka “Brother Louv” standing at the far right. The second chapter deals with the fabled “Black Tuna Gang.” This was an organization of businessmen who engaged in pot smuggling. They ended up being sacrificial lambs for the fledgling DEA. The agency was on the verge of having its funding pulled and needed a big bust to keep the money flowing in. Defense attorneys made the case that the DEA greatly exaggerated the success and ruthlessness of the “Black Tuna Gang” in order to create a media event. This debacle resulted in punishments that far outweighed the seriousness of the crimes (or so the defense claims). The segment includes some startling allegations toward to prosecution. The last chapter tells the story of fisherman turned smugglers in Everglade City. When their livelihood was threatened by overregulation from the government, the fishermen turned to procuring the “square groupers” that had become plentiful in the waters surrounding them. The effect this had on their community was not too dissimilar to the effects of crack cocaine on urban America (sans the violence). Signs of “redneck chic” abounded, with residents flaunting numerous “toys” purchased with drug proceeds. The high living came to an end when all of this new found prosperity attracted the attention of the FBI. Square Grouper is put together in a similar fashion to the Cocaine Cowboys films, sans two crucial elements: efficient pacing and a sense of immediacy. The world of pot smuggling is considerably more mellowed and subdued than that of cocaine. There are no murder stories from colorful characters like Jorge "Rivi" Ayala. But even taking such obvious differences into account, the pacing of Square Grouper is a bit too leisurely. Too often it gets caught up in legal minutia and meandering details. The second act is especially affected by this. When it gets to the actual trial of the Black Tuna Gang, the interviews are awash in legal jargon. 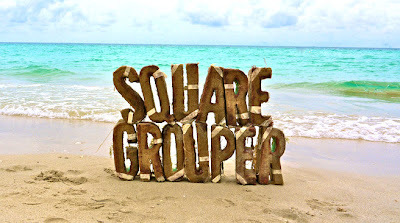 “Square Grouper” is just amusing where its immediate predecessors were unrelenting and gripping. It does, however, provide an interesting look at the mellow side of south Florida that is actually much more accurate a characterization of the region than Cocaine Cowboys. Billy Corben does not strike out at the plate, but offers a mere base hit where his audience might have been expecting a home run.